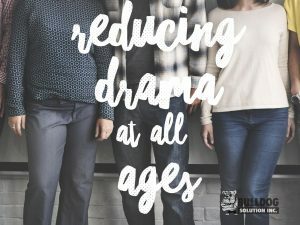 With October approaching fast and it being bullying prevention month soon, we at Bulldog Solution thought it would be a great time to talk about one of the biggest reasons for bullying: DRAMA. Below we cover reasons that drama occurs and strategies to reduce drama before it becomes bullying. It makes us feel powerful to share secrets, gossip, and rumors. People are relieved it is happening to someone else. We might be hurt and want revenge. We might be jealous and want something or someone that is not meant to be ours. It feels good to be part of the “in” group versus the “out” group. It is a learned behavior we develop from our parents, friends, siblings, and society. It’s fun to share drama with friends; sometimes you don’t realize what you shared. We start drama as a way to express being upset about a situation. Do not share gossip and don’t spread rumors. Learn about the different types of teasing (good, unintentional, bad). If someone tells you to not be friends with someone, stand up to that person. You don’t have to add to the drama online; you can ignore it. Only friend the people online that are your true friends. Don’t feed into the drama other people start. Don’t take things personally, learn to ignore the drama and be the stronger person. Think for yourself; you have the power to choose your friends. Know what is important to you and what values you hold. Know your strengths, qualities, and what makes you unique. Make sure your friends make you feel good about yourself. Address the drama immediately and set the record straight. Do not use violence as a form of retaliation to address drama. Talk to your friends about the expectations you have of them. We hope you can use one or two strategies and have your kids try them. Adults can try to use these strategies too. We often forget that we also deal with drama. Having some strategies under our own belt can help us overcome it and empower your children to do the same!